From left: Volunteers Ailsa Stewart, Frances Griffiths, April Pearson, Noble Carter-Hanley, and Collection Transition Assistant Jessica Kidd sewing cushions to support fragile ceramics during transport. Volunteers are our unsung heroes. They provide the backbone to many Gallery and Museum operations throughout New Zealand and are active supporters of the Sarjeant Gallery Te Whare o Rehua in Whanganui. The Sarjeant Gallery has 56 individuals registered and estimates they contributed 445 volunteer hours over the past year. The Gallery volunteers assist with a wide range of activities including being hosts at functions and providing refreshments at events. They help maintain Gallery communications and promotion by preparing mail outs and delivering flyers around town, as well as administrative assistance with back of house tasks and data entry of collection records. 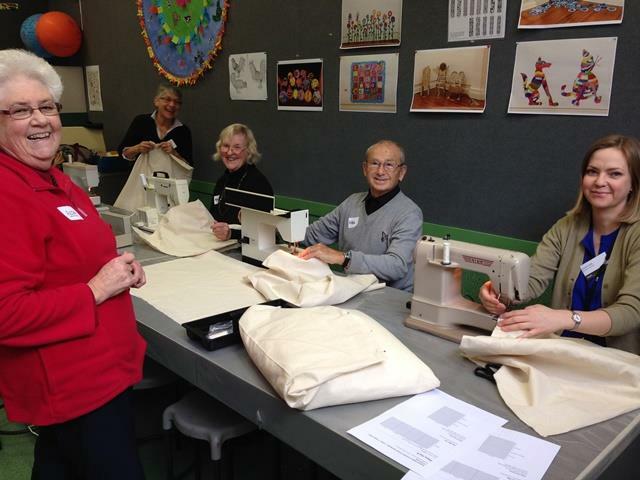 Volunteers made a significant contribution to the Transition Project by participating in sewing bees held in March and August 2014. In preparation for moving the ceramics and glass collection volunteers made cushions to support and protect the works for their transport to Sarjeant on the Quay. Over the course of two days 20 volunteers sewed a total of 40 metres of unbleached calico into various sized cushions filled with 2,100 litres of polystyrene beads, with many of the volunteers bringing their own sewing machines to use. The Gallery provided lunch and refreshments and everyone had so much fun they were keen to return to make more. The cushions made the packing process for the ceramics and glass extremely efficient, assisting the Gallery to move the collection out of the unsafe building within a shorter timeframe. 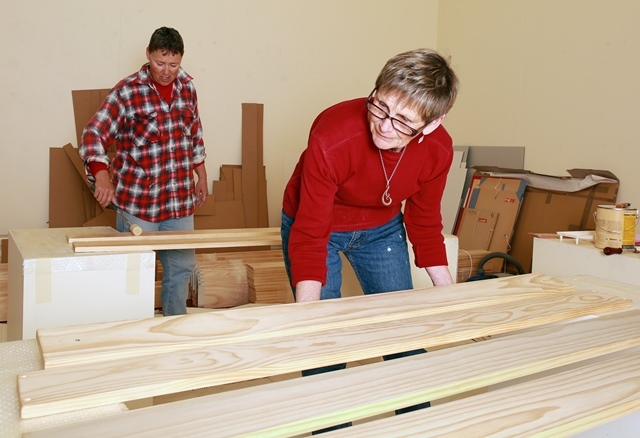 Volunteers also assisted with preparing wooden packing frames for transporting the 600 paintings in the collection. The 40 travel frames are designed for multiple re-use to relocate the paintings to Sarjeant on the Quay. The frames will then be used to return the paintings to their permanent home in Queen’s Park when the redevelopment is complete. Gallery volunteers varnished each of the components with 2 coats prior to construction of the travel frames. A total of 7 volunteers worked over 50 hours during 4 weeks to complete this task. Two thirds of the paintings have now been relocated safely to Sarjeant on the Quay and the travel frames are standing up well to the multiple re-use as a direct result of volunteers’ efforts. Without volunteers’ valuable contributions Gallery staff would be doing these time consuming tasks and it would place a considerable strain on existing resources. Each volunteer brings their unique specialist skills and experience with them and enriches the Gallery immeasurably as a result.